Picking a class is one of the most important things players go through when trying a new game. There are seven different races and everyone has their own reasons for picking one; combine that with 8 different classes, and you get many possible class/race combos, and picking the best one may not just be a matter of personal preference. 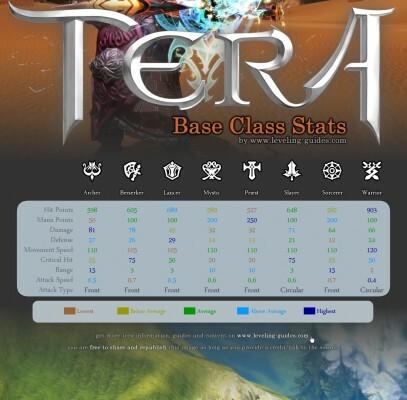 Every class has a damage and weapon damage rating. There’s no difference between physical and magical damage making damage resistance items obsolete. Instead, you can build resistances to critical hits, stuns, knockdowns and similar forms of crowd control. All classes except the Priest and Mystic have a “Backstep” skill, which is the main dodge skill. 12 Retaliate Leap to your feet while attacking your target if you’re knocked down. 20 Onslaught Rush your foe in a series of lunges. While lunging, you’re steadier on your feet and take half damage. 22 Guardian Shout Your courage massively boosts your party’s endurance. Does not apply to you, and ends if you are knocked down. 26 Shield Counter Gain a chance to shield-thump your foe while using the Stand Fast skill. You can’t be knocked down or immobilized, and take half damage while using the skill. 26 Leash Throw a magical hook and chain that drags an enemy toward you. Won’t work on huge opponents. 42 Master’s Leash Throw another hook to pull the target nearer. You can use this skill only after using Leash. 46 Lockdown Blow Deliver a crippling attack, hampering your target’s movement. Energetic Charging Lunge: Speeds the cooldown of your Charging Lunge. Energetic Second Wind: Reduces the skill’s cooldown, so you can recover more quickly. Lingering Debilitate: Your enemies are weakened by Debilitate even longer. Longshot Leash: Increases the range of your Leash skill. Threatening Challenging Shout: Your Challenging Shout draws even more enemy attention. Threatening Combo Attack: Your basic attack draws even more aggro. Threating Shield Counter: Add insult to injury, and generate more aggro with your Shield Counter skill. For more detailed Lancer guides including leveling, PvP tips, dungeon walkthroughs, gold farming, equipment, abilities, glyphs and more click here. 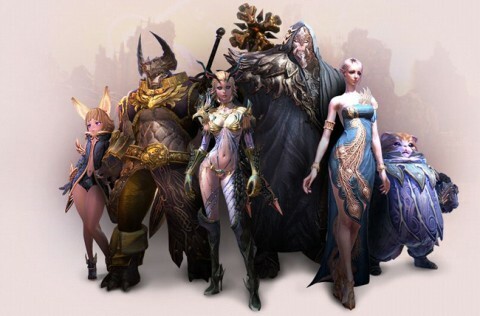 Warrior is the second and last tank in TERA. Warriors wield duel swords, wear light armor, and have the highest HP pool and movement speed out of all eight classes. Furthermore, Warrior attacks are an arc – meaning they are not purely single-target characters. If you and your buddy are in the path of the swinging swords, you will both get hit, instead of just one of you. Warrior’s damage rating is higher than a Lancer, making them third lowest; they are positioned between Sorcerer (lower) and Slayer (higher) on the damage rating. Warriors have a great technique for getting away or catching up to someone, although I personally do not believe it is as good as a Lancer’s. Warrior’s dodge is a great way to get away or chase someone; the simple flaw with this is the animation is different for each race. While a Castanic Female Warrior’s dodge is a fancy leap (which can leap over attacks), other races must suffice with a roll or somersault. Because of this, the majority of Warriors are generally Female Castanics; the smaller hitbox of the female Castanic also plaleveling-guides.comys a role in this, as Warriors are a tank that shouldn’t be getting hit by what they are fighting. 10 Defensive Stance Raise your endurance and draw more aggro with attacks. 24 Leaping Strike Leap on your foe and smash downward. If your opponent’s prone, you may do enormous damage. 26 Death From Above Your blow catches enemies by surprise. You’re invulnerable while you strike. 28 Traverse Cut Make three quick lunges, draining your target’s endurance. You can activate this skill faster and attack repeatedly if you chain from Pounce or Combative Strike. 28 Blade Draw Stab, then slash your target as you draw your weapon from the wound. Faster as a chain from other skills. 32 Mangle Spend mana, and your fourth Combo Attack cuts your foe’s speed substantially. 42 Backstab Speed in and make a lethal, immobilizing thrust to your target’s back. 54 Staggering Counter If you’re hit, counterattack and briefly stun your targets. Energetic Death From Above: Your skill cools down faster. Grounded Defensive Stance: The stance now raises your endurance as well. Lucky Battle Cry: Boosts your Battle Cry’s chance of stunning. Threatening Battle Cry: Your Battle Cry generates extra aggro. Threatening Torrent of Blows: Your Torrent of Blows generates extra aggro. Binding Torrent of Blows: Your Torrent of Blows may immobilize those it hits. Persistent Evasive Roll: Your Evasive Roll gains a chance to refresh immediately upon use. For more detailed Warrior guides including leveling, PvP tips, dungeon walkthroughs, gold farming, equipment, abilities, glyphs and more click here. Berserker is the first Melee DPS class I will cover. Berserker’s wield giant axes, wear heavy armor and have the highest weapon damage rating; tied with an Archer. Their damage rating is second only to Archer. Their crit rate is highest; tied with Slayers. Berserkers for some time were mistaken as a third possible tank, due to the fact that they also wear plate armor. This however is certainly not the case, although if pressed a Berserker can tank, it is not a viable options. Berserkers are meant to attack from behind along with the other DPS classes. Despite their heavy armor, they can be blown up pretty quickly whether it’s by a monster or by another player. 1 Combo Attack The berserker’s bread and butter: a series of strikes that charge mana and do more damage with each hit. 24 Leaping Strike Jump at your foe and smash down on them. If they’re knocked down, you can even do extra damage. 52 Bloodlust You’re nearly unstoppable, with greater strength and resistance to stuns and trips. If you’re fighting other players, you also do bonus damage. 58 Inescapable Doom Those nearby you are so frightened they move more slowly. If they’re players, they can’t use their evasion and movement skills. Balancing Tenacity: Greatly boosts your resistance to knockdowns and immobility. Carving Combo Attack: Your Combo Attack has greater odds of scoring a critical hit. Empowered Vampiric Blow: Boost the damage of your Vampiric Blow. Energetic Tenacity: Your Tenacity skill cools down faster. Fleetfooted Fiery Rage: You both move and attack faster. Hastened Cyclone: Your Cyclone skill charges up faster. Mindsparked Axe Block: When you block, you regain some mana. Slick Thunder Strike: While charging your Thunder Strike, you can move at your normal speed. Spirited Combo Attack: Your combos generate even more mana. Swift Flatten: Your Flatten attack lands faster. For more detailed Berserker guides including leveling, PvP tips, dungeon walkthroughs, gold farming, equipment, abilities, glyphs and more click here. 44 Exhausting Blow Strike a painful blow that slows other players’ reactions by increasing their skill cooldowns. 56 Backstab Sprint in and make a lethal, immobilizing thrust to your target’s back. Brilliant Leaping Strike: Your Leaping Strike costs less to use. Empowered Knockdown Strike: Your Knockdown Strike does extra damage. Energetic Tenacity: Reduces the cooldown of your Tenacity skill. Fleetfooted Evasive Roll: Gain a chance of raising your movement speed whenever you use Evasive Roll. Grounded Triumphant Shout: Fortifies your endurance. Lingering Startling Kick: Enemies hit by Startling Kick stay stunned longer. Powerlinked Knockdown Strike: Substantially increases the damage of your Whirlwind skill when used after Knockdown Strike. Restorative Overhand Strike: Recover some health whenever you use Overhand Strike. Spirited Triumphant Shout: Your Triumphant Shout regenerates more mana than usual. For more detailed Slayer guides including leveling, PvP tips, dungeon walkthroughs, gold farming, equipment, abilities, glyphs and more click here. 26 Stunning Trap Set a trap that briefly staggers the victim. The trap lasts for 20 seconds or until triggered. Slick Penetrating Arrow: You can charge your Penetrating Arrow skill and still move at full speed. Energetic Breakaway Bolt: Your Breakaway Bolt skill’s cooldown time decreases. Lingering Poison Arrow: Increases the duration of your Poison Arrow skill tremendously. Persistent Close Quarters: When you use Close Quarters, there’s a chance it will have no cooldown time. Spirited Rapid Fire: If you hit your target with Rapid Fire, there’s a chance your mana regeneration will increase. Fleetfooted Breakaway Bolt: When you use Breakaway Bolt, there’s a good chance it boosts your movement speed. Blazing Final Salvo: If you chain to it from Final Salvo, your Penetrating Arrow skill will charge a lot faster. Empowered Incendiary Trap: Your Incendiary Trap does more damage. Lingering Slow Trap: Your Slow Trap impedes affected targets a lot longer. Piercing Arrow: Your basic Arrow skill has a chance of doing double damage each hit. For more detailed Archer guides including leveling, PvP tips, dungeon walkthroughs, gold farming, equipment, abilities, glyphs and more click here. 2 Backstep Take quick steps backward and out of harm’s way. 6 Painful Trap Set a trap that explodes in all directions when stepped on. Trap lasts ten seconds. 56 Nerve Exhaustion Lock onto and hex nearby players so that they can’t use the basic attacks that recharge their mana. Persistent Magma Bomb: Gain a chance for Magma Bomb’s cooldown to refresh as soon as you cast it. Longshot Fireball: Increases the range of your Fireball spell. Spirited Mana Infusion: Your Mana Infusion replenishes more of your mana. Numbing Ice Needle: Your Ice Needle skill slows its targets even more than normal. Multiplicative Time Gyre: Capture even more targets in your Time Gyre skill. Lingering Ice Needle: When your Ice Needle skill slows a target, the chill lasts even longer. Lingering Glacial Retreat: Your Glacial Retreat skill slows your opponents down even longer. Numbing Painblast: Adds a chance that your Painblast skill may slow the movement speed of those it hits. Shared Fireblast: If your Fireblast skill hits more than one target, it does bonus damage. Hastened Fireblast: Cast your powerful Fireblast spell faster. For more detailed Sorcerer guides including leveling, PvP tips, dungeon walkthroughs, gold farming, equipment, abilities, glyphs and more click here. Mystics are a strange class, in a way they are a jack of all trades, but for the most part their skills are unique to themselves. Mystics have four different pets, known as Thralls. The first Thrall they acquire is the Thrall of Protection, which is a tank pet. The cooldown on the Thrall of Protection is ten minutes, and it lasts for ten minutes unless of course it dies. The Thrall of Protection generates quite a bit of threat, and can knock down the enemy it is fighting. The second is Thrall of Vengeance. This spirit of Lightning is a moderate DPS thrall, with a twenty-two second cooldown. After this, comes the Thrall of Life. This cute little fairy has the same skills as a Priest as far as heals go; including AoE Heal and AoE Dispel. Meaning, this little fairy can not only heal you, but can also heal your team mates. That being said, it only stays for twelve seconds, and is on a thirty-five second cooldown. Lastly, is Thrall of Obliteration. This thrall will attack once and disappear, which may seem odd for its ten minute cooldown, but one would assume it does a good amount of damage. 1 Arun’s Vitae Gather Arunic power into a mote that, when picked up, restores health and removes all harmful effects. 16 Arun’s Cleansing Touch Select your allies and purge all harmful effects from them. 20 Aura of the Swift An aura emanates from you that increases group members’ movement speed. 26 Aura of the Unyielding An aura emanates from you, greatly increasing group members’ resistance to critical hits. 28 Arun’s Tears Gather Arunic power into a mote that, when picked up, instantly restores a large quantity of mana. 50 Shara’s Lash Cast a caustic bolt of Sharan energy that explodes at range or on contact, briefly stunning foes. Brilliant Sonorous Dreams: Sonorous Dreams costs less mana to cast. Empowered Sharan Bolt: Your Sharan Bolt does more damage. Energetic Metamorphic Smite: Speeds up the cooldown of your Metamorphic Smite. Fortified Thrall of Protection: Strengthens the armor of your Thrall of Protection pet. Hastened Mana Infusion: Mana infusion restores your mana more quickly. Influential Metamorphic Smite: You can chain-cast Metamorphic Blast for less mana. Lingering Volley of Curses: Your curse hangs on your enemies even longer. Multiplicative Arun’s Cleansing: Increases the number of targets so you can help more of your friends. Persistent Teleport Jaunt: Adds a chance to refresh the cooldown of Teleport Jaunt when you cast it. Trebling Corruption Ring: Hugely increases your resistance to knockdown and immobility. For more detailed Mystic guides including leveling, PvP tips, dungeon walkthroughs, gold farming, equipment, abilities, glyphs and more click here. Surprisingly, Priests are capable of DPSing as well as healing, although it is advised that unless you are a very skilled Priest you only stick to healing. Priests also have an ability which I personally find pretty broken; Ishara’s Lullaby. Ishara’s Lullaby, quite simply, is a Lock-On sleep. With a cooldown of only thirty-five seconds, this is more than enough time for Priest to use it in order to interrupt an enemy’s charge up skill, heal themselves, then begin damaging their enemy again. Priest DPS is a combination of ranged (ten meter) and melee-range skills. 14 Ishara’s Lullaby Lock onto several targets and put them briefly to sleep. 40 Energy Stars Fires an energy bolt at a nearby enemy you select. The bolt damages the target, but it increases nearby group members’ strength and attack speed for several seconds. 42 Kaia’s Shield Cast a barrier that absorbs damage on several nearby allies and makes them immune to knockdown and immobility. Boosted Zenobia’s Gift: Reduces the casting time of your Zenobia’s Gift spell. Brilliant Resurrect: It costs you less mana to resurrect your fallen friends. Energetic Arise: Reduces the cooldown time of your Arise skill. Lingering Regeneration Circle: Your Regeneration Circle skill’s health-restoring effects last longer. Longshot Focus Heal: You can reach your allies from further away with your Focused Heal skill. Multiplicative Focus Heal: Your Focused Heal skill can touch more allies at once. Numbing Final Reprisal: Your Final Reprisal gains a chance to slow your target’s movement. Powerlinked Triple Nemesis: Greatly increases the damage of your Metamorphic Blast skill if you use it after casting Triple Nemesis. Restorative Healing Circle: Improves the healing power of your Healing Circle skill. Spirited Mana Infusion: Increases the mana recovery of your Mana Infusion skill. For more detailed Priest guides including leveling, PvP tips, dungeon walkthroughs, gold farming, equipment, abilities, glyphs and more click here. I hope this post helps. If you have any questions or any information to add, you’re welcome to post in the comments below.